Could a Guilia-based hatch be on the way? Alfa Romeo has been planning a full model lineup for the United States for a while now. 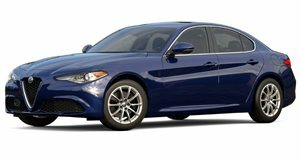 Oddly, the low-volume 4C led the charge with the four-door Giulia being continuously delayed. The 4C only sells around 2,500 units per year, so the Giulia will be the brand's volume seller when it finally arrives in late 2016. We have already fallen in love with the Giulia in our "Best Upcoming Cars For 2016" segment. The sedan will do battle with the BMW 3-series and Mercedes C-Class. But now Alfa Romeo apparently has new plans for the Giulia platform. If you live outside of the United States, then you are likely familiar with the Alfa Romeo Giulietta hatchback. The current Giulietta shares the Fiat FWD platform with cars like the Dodge Dart and is available with a range of gas and diesel four-cylinder engines. Now, FCA's head of passenger vehicle design revealed that the new Giulietta would be based on a shortened version of the Giulia's platform. This would likely mean that, like the Giulia, the new Giulietta hatchback would be RWD. This would put the Giulietta into a pretty rare category with the BMW 1-series hatchback that is not available in the United States. With the next generation 1-Series set to move to FWD, this may give the Alfa Romeo an edge over the competition. Not much information is known about a possible price or release date, but expect more information shortly after the launch of the Giulia in 2016. We are definitely excited to see what Alfa Romeo has in store. A hatchback version of the Giulia sounds like the perfect formula to kick the crap out of the BMW M division. If this hot hatch does indeed come to life, here's hoping it sees American shores.